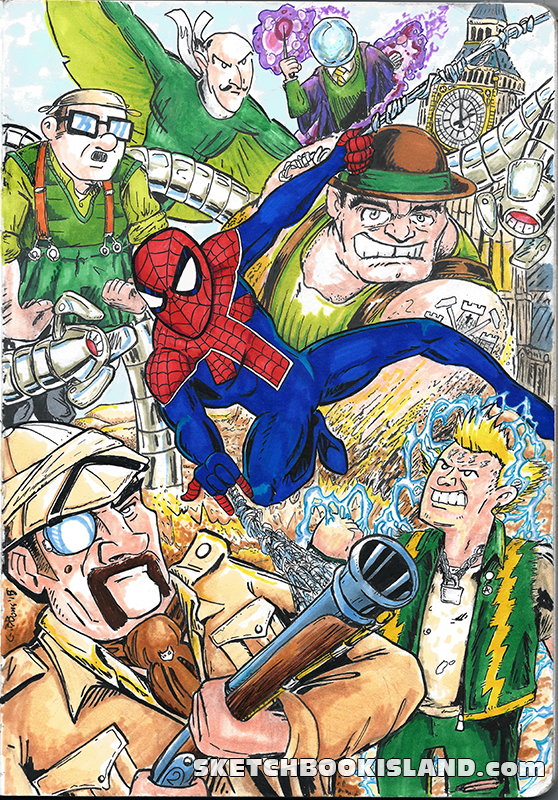 During the mega cross over Spider-verse we were introduced to by far one of my favorite incarnations of Spider-man: Spider-man from earth 138 a.k.a Spider-Punk. first showing up as a quasi-background player in this whole debacle and even in the moble app created for the event, Spider Punk didn’t really hit home until his short story “with great power comes no future” in Spiderverse #2. the story had an almost animated feel to it, I can’t stress how fun this was. we are introduced to Hobart brown (who became the prowler in the 616 universe), who along with his spider friends is fighting the man (the man being of course a venom powered Norman Osborn). If you are concerned that this wasn’t really punk then please take your argument to any other place on the internet where they like to categorize music in order to make what i like seem less. who are some of punk’s biggest enemies? Metal heads! thus the spider SLAYERs would probably be a particularly harsh thorn in his side. 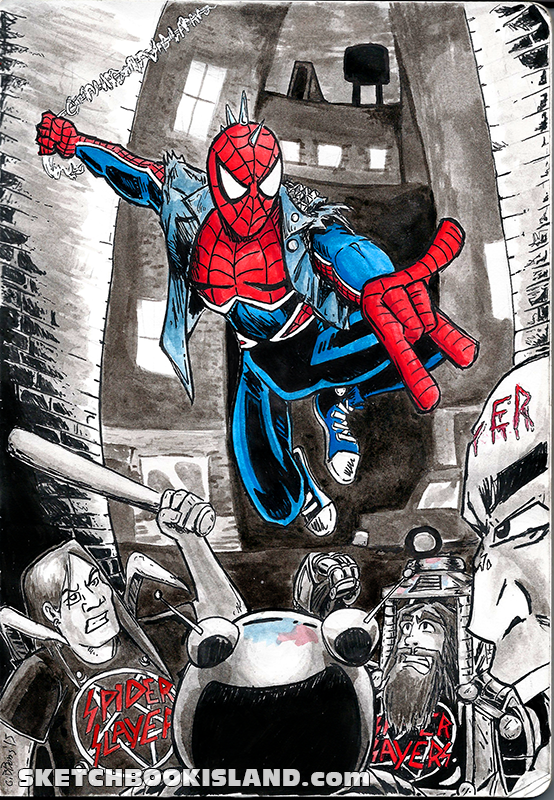 for this one I initially planed to use only ink wash, but after starting I felt I should add red as the more extreme Slayer fans tend to carve the bands name in their skin leaving it red and/or bloody, and since spidey is a two colored hero I added blue as well. 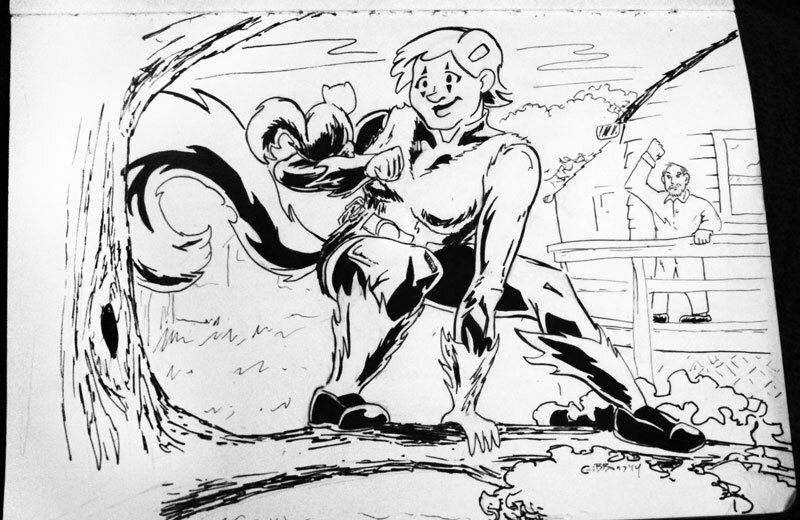 in celebration of squirrel girl getting her own series in January! crazy busy today but that’s not necessarily A bad thing. let’s see I have to finish up a very painful project which is going to be extremely ineffective, but is being heralded by people at a higher paygrade then I and thus must be smarter…right? At least it can be cobbled together from the parts of other (better) projects. My work on it has been compared to “Gordon Ramsey making a hamburger”, while I prefer to think of myself as more of an Alton Brown when it comes to my work, this comparison is pretty apt because I simply can’t stop yelling about it. I am putting he finishing touches on the Drunken Zombie Deadly Double Feature that is happening this weekend (only $7 for both “Bload-soaked” and “Mesa of Lost Women”) unfortunately with the holiday my schedule got shot to hell and I didn’t get a poster finished for it. fortunately I had a generic we could use as a back-up. Not to say that I build the elements for it, which I did, but I didn’t get to put it together in time, hopefully I’ll finish it and add it into my periodic “Movie poster info dumps”. and also due to the holiday craziness one of my freelance clients got lost in the shuffle; I felt terrible but when I finely got around to getting her some design thumbnails she could not have been more gracious about it, even had some potential follow up work I could do, sometime things just work out. 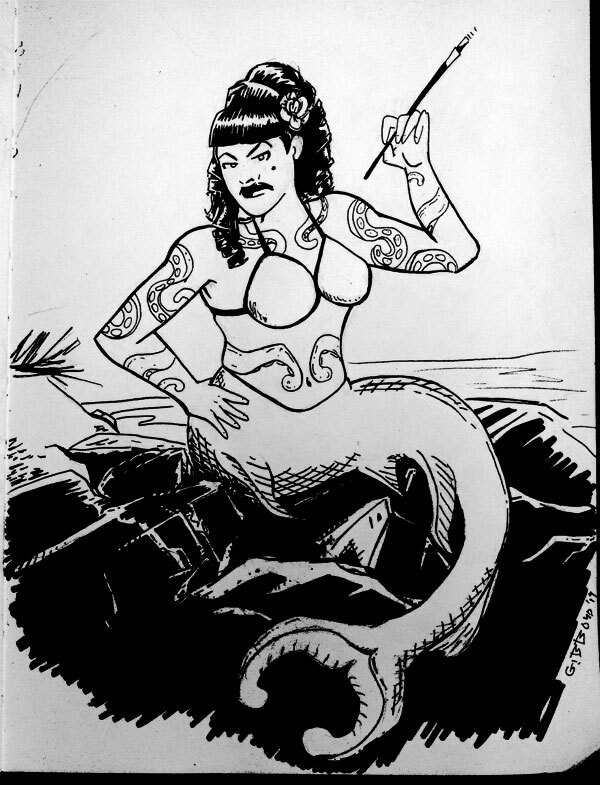 an experiment I tried was something called “Inktober” it was sort of a way to practice inking techniques by completing a small piece with full inks every day in November (god knows I need to work on spotting blacks), needless to say that didn’t happen, but what I did do was start a sketchbook that consisted of full pieces. I have found that, like some other artist friends, I shy away from using a nice sketchbook and rather opt for cheap spiral bound sketchbooks because I use them primarily for finding the best look for elements in my work such as drawing a hand several times until it looks right. the big drawback to this is that whenever someone asks to see your sketchbook, their is a welling up of embarrassment as they browse past your random scribblings to find the few full pieces. which is the case with the following pic. while shopping for a gift for a friends child I was delighted when I spotted a super Grover plush toy. I had figured that he had been forgotten in the marketing Juggernaut that Elmo, abby kadabby and other sesame street characters have become. upon further inspection I noticed that he had been updated to a sort of Super-grover 2.0 (I honestly do hope there was some sort of “death of super-grover” that involved four replacement Super-grovers, possibly including Iron monster and spider monster, before he ultimately reveled himself). This discovery led me to draw the following while watching TV that night. 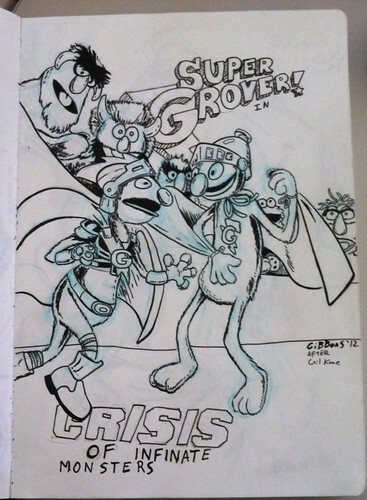 I felt that pairing pairing the two Super-grovers against each other in an interpretation of the classic crossover Green lantern #40. now while I know that Flash #123 was the actual debut of earth, but I am a bigger Green lantern fan then a flash fan plus it gave me that opportunity to replace the guardians with my favorite furry monsters from sesame street.